(Source) — The 10th floor of a Santa Ana courthouse was the site of a bloody brawl Wednesday between a defense attorney and an investigator from the Orange County district attorney’s office, authorities said. 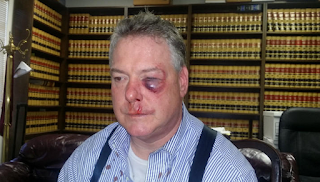 The fight erupted about 10:30 a.m. in the courthouse hallway between defense attorney James Crawford and the unidentified investigator, according to Orange County Sheriff’s Lt. Mark Stichter. 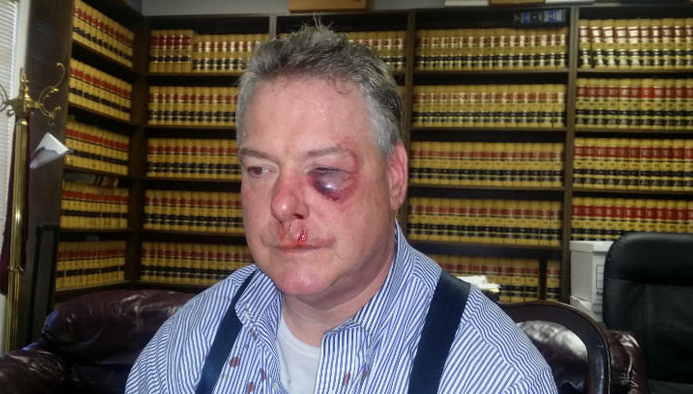 Crawford, who recently won a high-profile court victory against the district attorney’s office in the ongoing jailhouse snitch scandal, was left bleeding, battered and bruised. It’s unclear what, if any, injuries the investigator had. Jerry Steering, a lawyer representing Crawford, said his client was in the courthouse to represent a woman who was subpoenaed to testify. The D.A.’s investigator was assigned to watch over the woman, he said. When Crawford approached his client, the investigator disparaged defense attorneys as “sleazy,” Steering said. Crawford replied that defense attorneys were no worse than the Orange County district attorney’s office, which has been mired in an ever-widening scandal over the use of testimony from inmate informants. As Crawford walked away, the investigator flicked a large paper clip at the lawyer, Steering said. Crawford then tossed the clip back toward the investigator. “The investigator then grabs [Crawford’s] head and slams it into the bench and then punches him like 10 times in the face and head,” Steering said, adding that sheriff’s deputies and officers from the Santa Ana Police Department had to remove the investigator. If they don't set up a rematch in the octagon and make it pay-per-view, they are missing a golden opportunity. Note to investigators in the Wise County Courthouse: Don't even think about it! I have ninja moves!